Renowned golf course architect Pete Dye is well known for designing very demanding golf courses and he certainly lived up to his reputation with his Legends Moorland design. This Myrtle Beach golf course is known as one of the toughest tests of golf in the Eastern United States. Dye used many of the characteristics of his PGA West design by using drastic elevation changes, huge deep bunkers, signature bulkheads, multi-level fairways, waste areas and multi-tiered greens. The signature hole at the Moorland might possibly be one of the top holes on the Grand Strand. The sixth hole is only a 245- yard par 4, but it will challenge the very best players with a huge bunker guarding the green that is known as “Hell’s Half Acre”. This bunker definitely needs to be avoided. Like most Pete Dye golf courses, the Moorland offers Myrtle Beach golfers a very challenging and memorable golf experience. 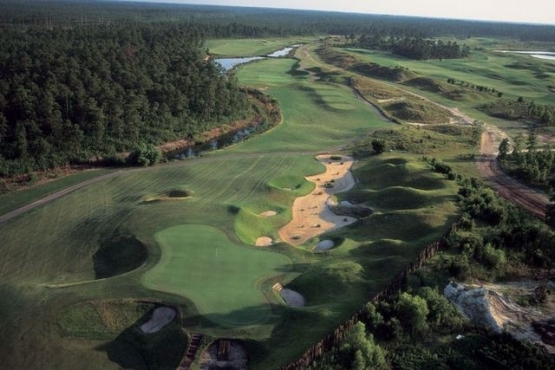 The Legends Moorland course would be the perfect Myrtle Beach golf course to add to a Myrtle Beach golf package. Myrtle Beach golf packages offer the very best Myrtle Beach golf deals. They feature the finest Myrtle Beach championship golf courses while combining them with the finest Myrtle Beach accommodations. While visiting Myrtle Beach you will certainly want to check out the wide variety of Myrtle Beach entertainment and Myrtle Beach shows. It is time to book your Myrtle Beach golf pacakge today!